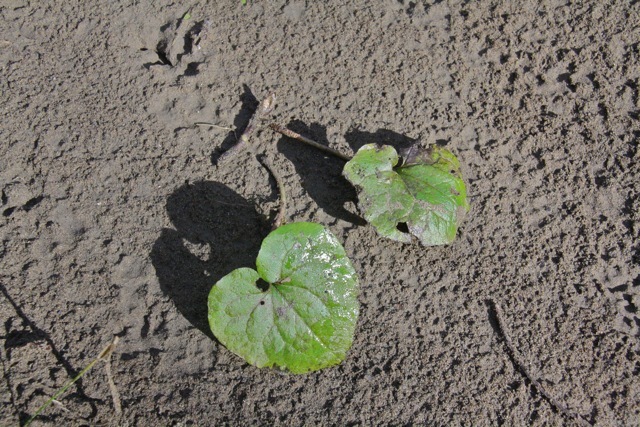 P alm-sized, heart-shaped leaves grow in a thick patch under a grove of alders on the river bank. 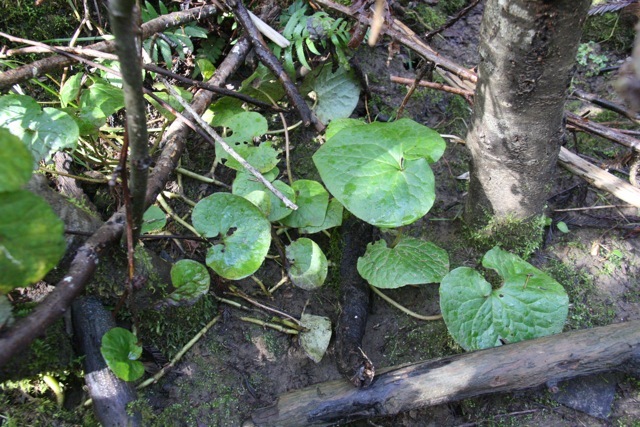 This is wild ginger, or Asarum caudatum. The leaves and root, when crushed, release a sweet spicy smell; to me it’s not quite ginger-like but others disagree. In the old days the root was used as a substitute when ginger couldn’t be found. Wild ginger root can be harvested year-round, but is supposedly best in the fall. The leaves can be made into a tea. Leaf and root were used both internally and externally to treat headache, joint pain, indigestion and head colds. It was also used as a laxative, and a poultice of warmed leaves was applied to toothaches and boils. Though these little plants are low-growing and seem fragile, they are actually an evergreen. They spread by rhizome in moist areas, forming clonal patches that are actually all one plant. This dense growth makes wild ginger a good groundcover for shady, moist native gardens–but it spread slowly, so is only for those with patience. There are several other species of wild ginger, all in this genus, that grow elsewhere in California, but this is the only one in the greater Bay Area. It also goes by the common names of longtail wild ginger and creeping wild ginger. It can be distinguished from its cousins in several ways, such as its small reddish-brown flower whose three petals have a long, dramatic taper like a showman’s waxed moustache.